The thing about the DESE's professional development is that they do it up right. Today we were the recipients of the wisdom of Kim Marshall, the author of Rethinking Teacher Supervision and Evaluation. Our leadership team at Wright City read this book as part of a book study and to prepare us for the new teacher evaluation system the state is in the process of changing to by 2015. The book is great, discussing the merit of face-to-face dialogue following a teacher observation, not the dog and pony show that teachers put on for their admin, but after a short visit. These short visits, many over a period the of the school year, give a better view of the classroom than does an annual review. As a teacher I never enjoyed the annual visit, but felt that when my principal came in a few times over the quarter, she had a much better idea of what I was accomplishing in my teaching. What I like the most about his proposal of eliminating the annual visit and concentrating on the multiple visits is that as a principal I have more opportunities to see what is going on, offer more praise and/or suggestions for improvement, and being able to tell parents that I am in the classroom often and know the quality of work that is going on there. 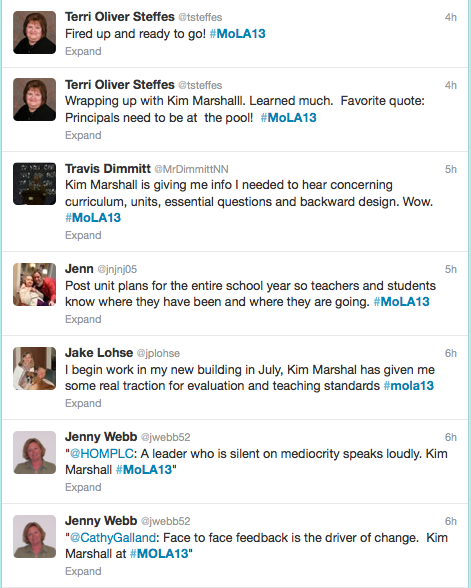 You can see by the tweets (here are a small sample) that were flying around that we were hearing a lot of good things!! Summing up the meeting, I learned how much a principal can see in 5-10 minutes, what impact the follow up conversation with the teacher can have, the importance of being with the team while unit planning and what that tells me about a teacher, and how merging the snapshots taken throughout the year can make a much more effective evaluation than just doing the annual visit. Our district does do walk-throughs, and the annual visit, but Kim Marshall was showing us the value of just the walk through, with more structure, more impact and better evaluations. Thank you DESE, the RPDCs and the Leadership Academy for all the work you did putting together this wonderful start to our year. Next post will be in October, after our Outdoor Leadership Event. Me, camping? Should be quite interesting!